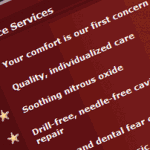 Your dental website can feature up to fifteen (15) dental practice services and benefits – short statements that let your potential patients know more about your practice at this location. We have provided a large library of these short statements, organized by topics. You can use any of these suggestions, you can edit the suggested statements, and you can write your own by clicking on the “New Service” button at the bottom of the page. It’s also easy to rearrange the order in which your Services & Benefits will appear on your website by using the “Move Up” and “Move Down” buttons. The “Services & Benefits” area in the “Practice Locations” section is where you offer more details about what your practice offers. It appears as a bullet point list on the lower right hand side of your website’s home page. We have dozens of options for you to choose from, arranged by category; just click the arrow button to add it to your own list. Or you can click “New Service” and write your own. Click the pencil icon to edit the text, or the trash can icon to delete it. Use the arrow keys to re-order your list of Services & Benefits.” Then check out your changes on your live website.